One of my focuses this year as Diploma Programme Coordinator will be to work with the schools educators to devise a secondary wide academic honesty policy. This is the first time I have had to lead a collaborative project across the secondary and I am spending a lot of time thinking about how best to implement this. The easiest thing, and the first thing that I considered, would have been to simply lift policies from previous schools (with permission of course – oh the irony!) and adopt it in the new context. On reflection I decided not to go down this path because doing so would have meant we lost a good opportunity for collaboration amongst the team and would have probably also ensured that we didn’t get the buy in and subsequent up-skilling, that we need if the policy is going to be successful. Teaching academic honesty is one of those things that I think it is easy to expect everyone on the teaching team to be able to do and assume that they know how to do it when in fact there may well be understandable knowledge gaps within the team. Different people also respond to their own knowledge gaps differently. Not admitting to knowledge gaps is an behaviour that can develop insidiously in educators due to perceived peer, parent and student expectations. The culture of a school may well be one where, admitting ignorance is something that is frowned upon. I am also aware that simply admitting ignorance isn’t enough. People need to be motivated to fill the gaps once identified and this process takes effort. We all avoid the effortful path at times. For this project, I decided to go down the long road and start afresh. I want buy-in from the team and I want to identify skill needs amongst the team so that we can begin to help teachers develop their own skills in this area, as well as develop a deeper understanding of the IB requirements for academic honesty. 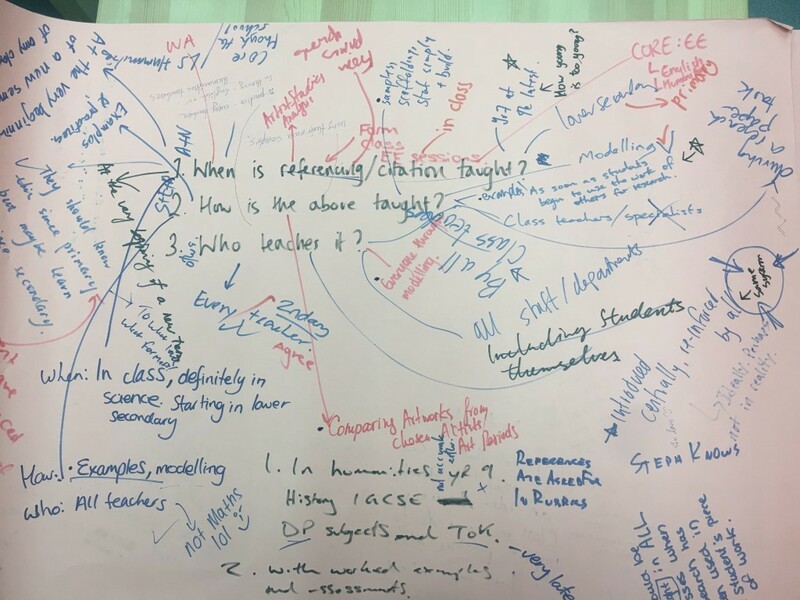 One of the things that I learned as a workshop leader with the IB is that all training sessions with staff should aim to help colleagues develop their teaching skills and share pedagogical techniques as a secondary objective to the primary aims of the session. 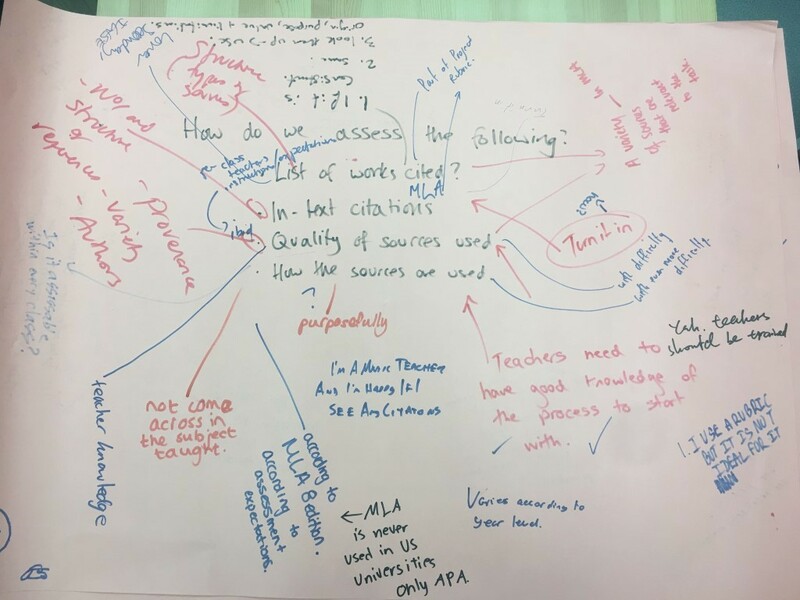 Thus, when I utilised one staff inset session in October, I planned to use visible thinking routine “chalk talk” as a route to triage where the team was in their thinking and understanding about academic honesty. I started this session by introducing chalk talk with a practice question. 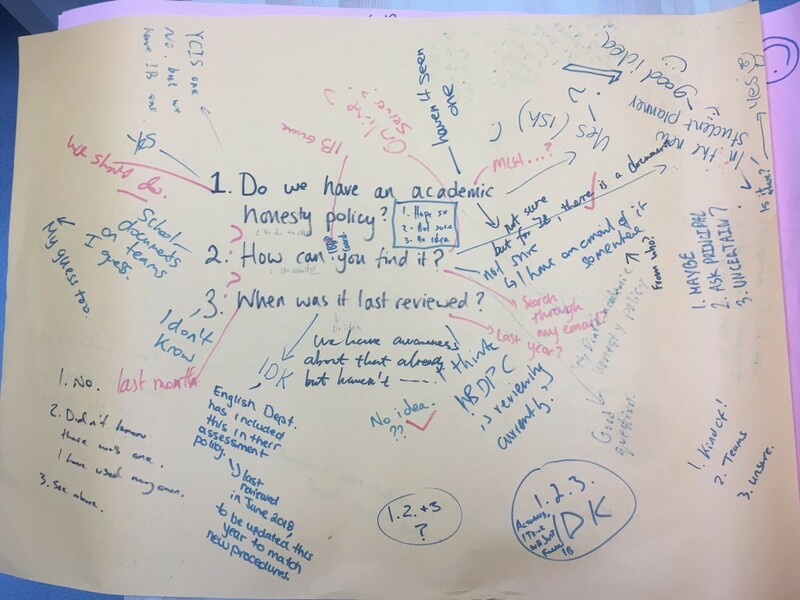 On a prior inset session led by another team member we had looked at Hattie’s research and so to transition from that I chose the question: “Is homework necessary?” to get the team used to the format of the chalk talk. For the main event, I took questions from the IBO’s documentation on academic honesty and grouped them into categories. I prepared the session in advance by writing questions onto the back of the paper I was going to use. 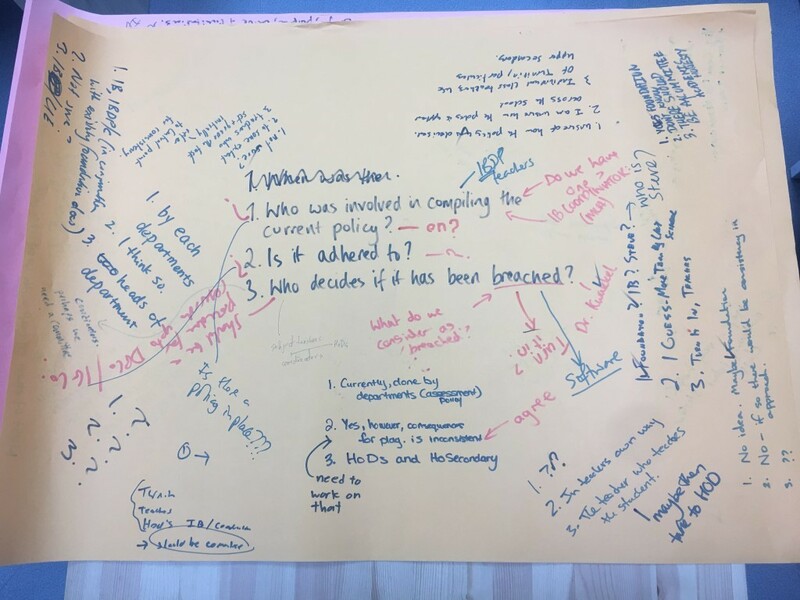 In this chalk-talk, instead of answering one question and rotating through each table, each table had a different set of questions that each group responded too as they rotated through them. Following from the chalk talk, I asked each group to summarise the discussion and responses prompted by the questions they started with. I gave them 15minutes to prepare a presentation for the rest of the team, and asked them to reflect on that instruction: how do they effectively get their students to collaborate on tasks like this? How do we teach students to work collaboratively or do we expect that they will be able to do it? We ended the session by sharing the general findings from each of the groups. Following on from this session I have written and disseminated a survey based around some of the concepts surrounding academic honesty and citations, in order to give staff a chance to have some continual input into the formation of our academic honesty policy. 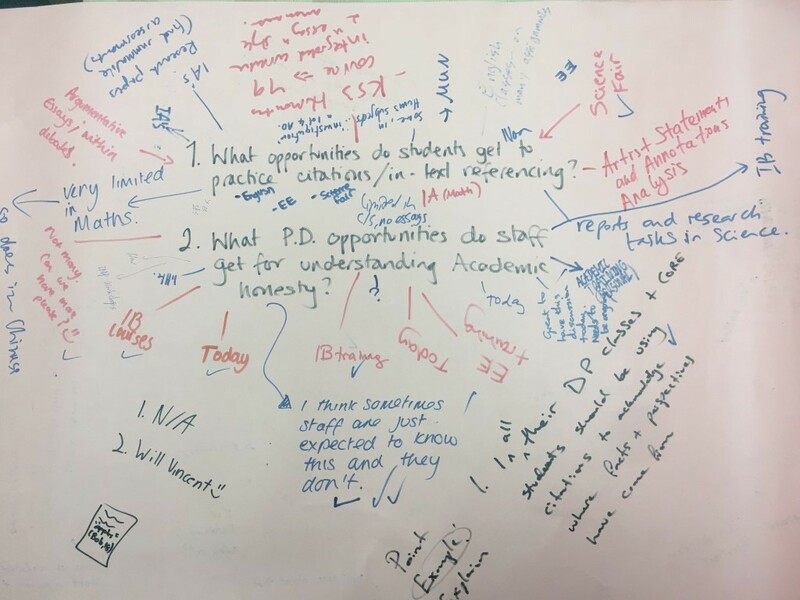 In January I hope to be able to review the data collected from this chalk talk and survey to begin working on developing our policy but I am unsure of where to take this next to ensure collaboration and buy-in amongst the team. If you have any ideas I would love to hear them!